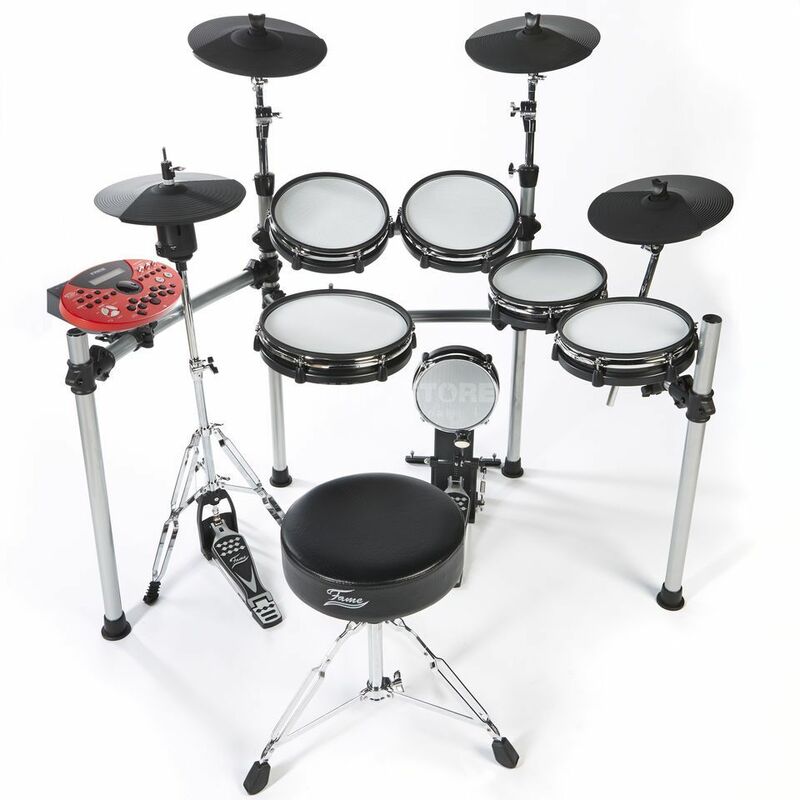 The top model of the Fame E-Drum sets, the DD-ONE Professional is equipped with modern trigger technology, mesh heads for authentic playability and a powerful sound module. The DD-ONE Professional E-Drum set offers all the same features of the big brand manufacturers, but at a much lower price! But that's not all: With the DD-ONE electronic drum system, for the first time Fame offers a HiHat which is mounted onto a real HiHat stand to make the drum simulation perfect! The sounds on the DD-One module have been exclusively recorded for us in a renowned Cologne recording studio in order to achieve the best possible sound effect. Many Oriental and even orchestral sounds are also available. High-quality mesh heads promise a great drumming feel for professional studio and stage applications. All sounds were recorded exclusively for this project in a Cologne studio. As a drummer, you are now playing with the latest drums sounds, be it live or in the studio. The FAME DD-ONE Professional offers an unbeatable price to performance ratio in combination with professional playability for any situation and the best possible e-drum sound. The FAME DD-ONE professional opens the sound world of the Orient through a variety of drum kits and other instruments. You can choose from simple, exotic percussion instruments such as Tabla, Udo, Tipanka or Darburka in different variations. This makes it is easy to mix modern dance sounds with Oriental sounds into a cool drum kit. With the DD-ONE Professional, anyone can now become a professional orchestral drummer. Play the orchestral instruments Timpani, Snare, Piatti-Crash, Orchestral Hit and 20 different shells from C1 to G2 in all desirable combinations. Thus, the Fame DD-One Professional is very suitable for the composition of film music or soundtracks. Please note: the drum throne is not included. The DD-ONE professional features so-called "mesh heads" on all of its drum pads. This not only improves the play feeling, but also allows accurate, precise and dynamic triggering. Drum pads with mesh heads are significantly quieter than plastic pads. While in many comparable drum systems, the kick pad only has a plastic impact surface, the DD-ONE professional can also impress with a mesh head here, thus providing clear advantages in terms of realistic playing. Both the 12 "snare pad and the 4 Tom pads with a diameter of 10" are dual zone pads, which means that they are equipped with additional triggers at the edge, which can be allocated additional sounds. Cymbals in various pitches with additional orchestral drum sounds. The Hi-hat of the DD-One professional is mounted onto a conventional stand, as with an acoustic kit. The DD-ONE professional comes with a total of 4 cymbal pads, all with a diameter of 12 ": 2x Crash Cymbal, 1x Ride Cymbal and 1x Hi-Hat Cymbal Hi-Hat stand, an open or closed Hi-Hat sound can be selected by foot. The Ride Cymbal is a dual zone pad and has an extra large bell that can be allocated an additional sound. The powerful DD-ONE professional sound module is the heart of the DD-ONE professional electronic drum system. In addition to a wide selection of drum and percussion sounds, it also offers the possibility to edit sounds and adapt them to meet your personal desires. Of course, you can also make your own drum kit from the existing sounds. A wide range of connections allows the easy integration of additional equipment. The MIDI connector allows you to connect to a computer, for example, to trigger your own sounds stored on the computer. Via the AUX IN, a CD or MP3 player can be connected to jam along side your favourite music. Amplifiers or monitor boxes are connected to the sound module via the output (R, L / MONO). An SD card slot allows you to store your drum kits on an external SD card. Finally, the Phones output allows silent practicing with headphones. The DD-ONE professional also comes with a complete hardware package. The drum rack is relatively light and easy to transport. The individual elements can also be positioned very flexibly in order for you to implement your personal ideas of the perfect setup. All the necessary pad and cymbal holders are included as well as the pedal and HiHat stand, so that you can start playing immediately. On the back of the module, there are, in addition to the trigger inputs, additional connections for external equipment. The one thing you can count on with anything made under the Fame name its well built and fantastic value for money and this kit is no exception. The tubular frame is sturdy and adjustments can be made very easily. The pads are robust and work great just tension the mesh heads to your taste. The sounds are great and you have lots to play with the Hi-hat is great and so is the foot-pedal not top of the range but more than good enough for the job. Right so everything is fantastic.... well not exactly, it takes a while to get used to adjusting sounds to your taste as the manual could be a little bit more clearer, the rubber cymbal triggers are good but I've noticed the hi-hat one is already showing some wear I wonder how long it will last and how easy it would be to get replacements? They don't state if you could replace them with other makes of triggers like Roland if one fails. I would definitely recommend this as a practice kit for the home as it makes no noise at all when using the headphones so it keeps the neighbours happy. For gig use I would have preferred individual volume controls for each pad but you can alter this with a bit of fiddling with the settings and on live gigs you may not have the time. I've yet to see many spares for this kit appearing on Music-stores pages lets hope they keep supporting this kit and offer upgrades. Unbelievable product for the price. I would recommend this drum kit to anyone. The features on the DD One are only second to kits with a much higher price tag. The customer service from the Music Store is also very efficient, speedy and professional. I bought this based on the reviews here, and can't agree more. Fantastic value for money, very sturdy and easy to assemble, this is very close to the sensations of playing an acoustic kit, plus all the amazing features of e-drums. My 10 year old son recently started lessons and he can't stay off it... We tried out other major brands at the same price point, and my biggest deception with them was that you just didn't feel like you were sitting behind a kit, let alone feel like you are playing one. I can imagine without the Hi-hat and mesh Kick you'd have to learn one technique for acoustic and another for e-drums... whereas with the Fame dd-one you can forget you aren't on acoustic drums... Thank you MusicStore! I'm no drummer but I use this to link to my Cubase DAW and put down simple beats which I then trigger samples. For the money you will not be disappointed! Very well made. The onboard sounds are ok but not worth recording. Would be fantastic in a live venue though. Would be nice to have the ability to add further sounds to it. A pro drummer friend of mine rated this kit highly!!! So far I'm very happy with it. Does exactly what I want it to do.